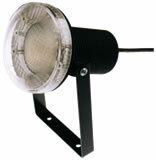 For complete order details on the PAL-2L and PAL landscape lighting accessories available, click here. This section also includes details on the PAL-2L Hard-Wired Transformers, to see more details click here. 1. Locate the position for mounting the PAL fitting to obtain the best light spread for the application. 2. Mount the fitting via the 2 holes in the bottom bracket or with the garden stake and adjust the fitting via the (2) two angling screws to position the fitting to obtain the desired lighting effect. 3. Find a suitable position to mount the transformer ensuring it is a minimum of 300mm above the ground level and keep pipes/wires away from the transformer to avoid damage. The transformer must be installed to comply with AS3000. 1. Remove the clip-on lens cover and unscrew the (2) two housing screws in the front of the fitting. Then unscrew the (6) six lens screws to unclip the lamp from the lamp socket as shown on the Assembly drawing. 2. Replace the Lamp. Note: To ensure reliable operation of your PAL it is essential to use a genuine PAL-2L Lamp/Seal Replacement kit part no. 39-2DL20 or BAB/CG 20 watt Xenon Lamp with UV Cover Glass. NOTE: The Maximum Wattage on the PAL-2L is 35 watts. 3. When reassembling the PAL-2L fitting ensure the "O" ring is sitting correctly and replace the (6) six lens screws and ensure the screws are not overtightened.